Hi, I am interested in your 1965 Ford Mustang (stock #1672-TPA) listed on Autotrader for $25,995. I'd like to get more information about this vehicle and confirm its availability. 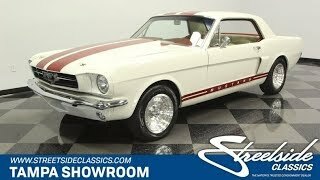 With a speedy look, V8 heart, and rare legacy, this 1965 Ford Mustang California Special tribute is the kind of classic that delivers all the best you love of this icon. When you look at the VIN, it tells you that this one will always be desirable. The motor code identifies this as one of the early 1964.5 Mustangs. But while the history hooks you, its the upgrades that will reel you in. The iconic Wimbledon White was part of a later professional application, so theres a ton of gloss and shine. And the red stripes painted across the top and on the rockers immediately identify this as a speedy machine. Of course, so does the cowl hood, hood pins, quad tailpipes, and 15-inch polished solid racing alloys. Plus, you have the best from the California Special in this tribute, including the side scoops, well-integrated rear spoiler, and wide sequential taillights. So this is a very distinct coupe thats full of personality. Inside the white and red theme continues. In fact, the colors are so expertly intertwined, you even get red seatbelts on the white seats. So youll love keeping all the windows down on this coupe so that people can see the cool two-tone. But more than just nice-looking colors, youre going to enjoy this one because its a drivers machine. Thats why you have upgrades like the wood and chrome Grant GT sports steering wheel, and beyond that, theres a full classic-style VDO gauge upgrade, including a large speedo and tach. Under the hood is Fords sturdy 289 cubic-inch V8. It looks great with the upgraded valve covers, tidy wires, and even a new distributor. It inhales deeply thanks to a large Edelbrock four-barrel carburetor. That helps give you nice power and a sweet sound out of the dual exhaust. Plus, with the three-speed automatic transmission and the upgraded wheels allowing for better modern tires, you have a cool-looking classic thats built to cruise comfortably. Heres a desirable early Mustang dressed with the best from some of the speedy special editions that came after it. This is a unique machine, and theres only one up for grabs, so call today!